Research conducted within the UC CEIN has been organized into seven integrated research groups (IRGs). 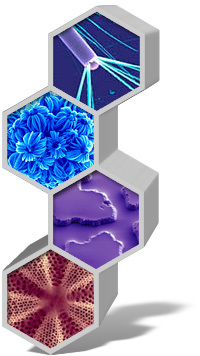 This interdisciplinary structure allows UC CEIN to (a) create a library of nanomaterials; (b) understand the effects of nanomaterials on organisms and ecological systems; (c) characterize the mobility, persistence, and reactivity of nanomaterials in the environment; (d) design a predictive model of toxicology and environmental impacts of nanomaterials; and (e) develop guidelines and decision tools for safe design and use of nanomaterials. Terrestrial Ecosystems Impact and Hazard Assessment. Theme 1 will synthesize and characterize a library of standard reference materials (SRMs), to be supplemented with commercially produced nanomaterials (e.g., carbonaceous, metal, oxide). The fully characterized SRM library will represent a broad range of nanomaterial compositions, structures, morphologies, reactivities, and interfacial properties that will in turn generate a combinatorial nanomaterial library. This combinatorial library will serve as the basis for mechanistic (Themes 2-4), high-throughput (Theme 5), and deterministic modeling (Themes 5 and 6) studies designed to probe the environmental fate and transport of these materials as well as their cellular, organism, and ecosystem toxicity. The goal of Theme 2 is to develop high throughput screening (HTS) approaches that can be carried out in tissue culture cells, bacteria, yeasts, and zebrafish embryos to develop predictive toxicology paradigms that relate potentially hazardous engineered nanomaterial (ENM) properties to adverse biological outcomes in cells and terrestrial and aquatic organisms. High content or high throughput screening is done in close collaboration with other themes to prioritize UC CEIN's ability to address important nanomaterials through expedited hazard risk ranking. Building on the work of Themes 1 and 2, Theme 3 will generate the experimental data to predict the concentration of nanoparticles (NPs) to which organisms will be exposed in different environmental compartments, and the NP physicochemical processes that may have enviornmental implications, such as NP reactivity and its effect on environmental conditions. As with other themes, we have focused our studies on the metal, metal oxide, silica and carbon nanotube (CNT) nanomaterials that have been acquired, synthesized, and characterized by Theme 1. To achieve this, we have focused on experimental studies to correlate the key parameters that control NP fate and transport processes, such as aggregation, dissolution, attachment to mineral and biological surfaces, persistence, reactivity, and bioaccumulation and bioprocessing, with NP characteristics (measure by Theme 1) and environmental conditions (such as the soil and water chemistry in Theme 4 and 5 studies). We are initiating the generation of life cycle assessments for a few NPs in different applications beginning with CNTs and we also plan to develop methods to measure environmental concentrations of NPs, which are serving to evaluate the predictions made using Environmental Multimedia Distribution model, developed by Theme 6 using data from Theme 3 and other literature. The overarching goal of Theme 4 is to discover and understand the effects of engineered nanomaterials (ENMs) on terrestrial environments, with the aim to predict and avoid such effects. The societal drivers for studying effects on ENMs in terrestrial environments are: maintenance of ecosystem services (e.g. nutrient cycling, pollutant biodegradation, and plant fertility), agricultural crop production and food quality, and water quality (i.e. groundwater, used as a drinking water source). ENMs are expected to enter terrestrial environments in the U.S. mainly via land application of wastewater treatment plant biosolids; ENMs may also deposit to lands from the atmosphere (e.g. automobil exhause carrying nano-CeO2 from cayalytic converters) and from direct water-to-land processes (e.g. spills near manufacturing sites, painted facades, or personal care products released into recreational bodies of water). Theme 4 researches the feedbacks between ENMs and terrestrial environments and thus seeks to describe not only effects on organisms, but also bioprocessing of ENMs in soils and plants, whose results can inform ENM fates (the foci of Theme 3). Theme 5 has a specific focus on aquatic (marine and freshwater) ecosystems. The overarching goal of Theme 5 is to address questions about the impacts of engineered nanomaterials (ENMs) on key ecological processes that help to control the abundance and distribution of organisms in freshwater and marine ecosystems. Researchers test hypotheses involving individuals, populatons, and communities of flora and fauna that perform ecological processes that help to generate important ecosystem services, including the maintenance of biodiversity, water quality, food webs, nutrient cycling, and the provision of economic resources for humans. The work is conducted with studies of the embryos of marine organisms, wchich are essential for identifying possible adverse effects of nanomaterials on development in early life stages. Work in vivo and in vitro with organelles, cells, and tissues of adult marine animals provide insight into the responses of individual whole organisms and populations. This body of work has strong intellectual overlap with the work in Theme 2 and Theme 4. Theme 6 will integrate data provided by Theme's 1-5 into a database that will be available to researchers and industrial partners interested in mobility and toxicity assessment and estimation. In addition, IRG will develop a tiered multimedia model that will serve to: (a) evaluate the significance of nanomaterial transport and exposure pathways, (b) rank the potential impact of nanomaterials in the environmental media, and (c) guide nanomaterial research and regulatory activities for the safe design of nanomaterials. Theme 7 will develop new tools for surveying the perceptions of the risks to the environment of nanomaterials and nano-enabled products. The group will study the concerns of both targeted special interest groups and the U.S. public. Analysis of governmental regulatory structures, standards, and policies will enable Theme 7 to determine whether governance structures and social variables either amplify or reduce perception of nanotechnology's environmental risk. Additionally, meta-analysis of the risk and risk communications literature for relevant new technologies (e.g., chemicals, energy) with seemingly analogous attributes to nanotechnology will be conducted. Knowledge obtained from the surveys and analyses will support Theme 7's work with science journalists in developing a socially sustainable, environmental risk communication with the public.